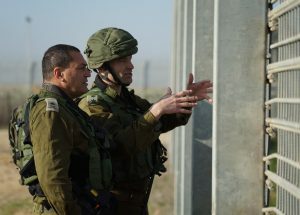 Israel Defense Forces Maj. Gen. Eyal Zamir, GOC of the Southern Command, near the Kerem Shalom border crossing between Israel and the Gaza Strip in late January after a Hamas tunnel was destroyed. Credit: IDF Spokesperson’s Unit. via JNS.org. EXECUTIVE SUMMARY: All the economic benefits being offered to Gaza as part of a package deal – an improvement in water and electricity supplies, the construction of a seaport, the cancellation of debts owed by the Hamas government, a relaxation of the Israeli security blockade – hinge on Hamas accepting conditions it is categorically unwilling to countenance. Intensive efforts are underway to reach a long-term, comprehensive truce arrangement between Hamas in the Gaza Strip and Israel. Former members of the Israeli defense establishment have expressed skepticism that such a truce is feasible. In their view, a limited truce might be more realistic. Reaching a broad cease-fire arrangement would be “a very complex maneuver,” said Col. (res.) Dr. Shaul Shay, former deputy head of the National Security Council of Israel. Egypt is leading the attempt, mediating talks and hosting senior Palestinian delegations in Cairo. A high-ranking UN coordinator in the region, Nickolay Mladenov, is also involved. Shay, who today serves as director of research at the Institute for Policy and Strategy (IPS) at the Interdisciplinary Center Herzliya (IDC) in Israel, pointed out that a long-term arrangement for Gaza would be possible only if two components are put into place. The first is a reconciliation agreement between Fatah and Hamas, and the second “is a period of calm between Hamas and the State of Israel. The two things are interlinked,” Shay said. “In order to obtain a long-term period of calm, there needs to be major investment in the Gazan economy and infrastructure,” he went on. “That means bringing the Palestinian Authority (PA) to Gaza. Because this is a condition, it is very problematic. If you look back, ever since Hamas seized power in Gaza in 2007, there have been countless attempts, led by Egypt, to reach Palestinian national reconciliation.” None of them have succeeded, Shay pointed out. On the other hand, a more limited truce involving the end of Gazan border demonstrations – and the cessation of incendiary kite and balloon attacks from Gaza, which have burned large swaths of Israeli farmland, harmed wildlife, and affected Israel’s honey production before Rosh Hashanah – is feasible. In exchange, Shay said, Israel could reopen the Kerem Shalom border crossing, allowing more materials to flow into Gaza, and expand the fishing zone for Palestinian fishermen. Any such arrangement should also include the return of the bodies of two IDF soldiers held by Hamas, Oron Shaul and Hadar Goldin, who were killed in combat during the 2014 Gaza conflict, in addition to the return of two Israeli nationals being held captive by Hamas. “This must be a condition,” Shay said. Echoing Shay’s assessment, Dr. Col. (res.) Moshe Elad, one of the designers of the security coordination between the IDF and the PA, said any attempt to reach a full agreement was very likely to end in failure. “There are a number of arenas involved; each is more complex than the other,” said Elad, currently a lecturer at Western Galilee College. Hamas and the PA have failed at all previous attempts to settle their differences, and “this time will be no different,” he said. “There are smaller [armed] groups in Gaza that are known as the rebellious groups. The truth is, if Hamas wants to, it can rein them in. But the problem is that Hamas does not want to stop them. It wants to use them to threaten Israel. Israel will insist on full quiet. It will insist that not even a single shot is fired. Hamas won’t agree to that,” Elad said. All the economic benefits being offered to Gaza as part of a package deal – an improvement in water and electricity supplies, the construction of a seaport, the cancellation of debts owed by the Hamas government, a relaxation of the Israeli security blockade – hinge on a PA-Hamas agreement, but Elad does not see “any intention” by the PA to agree to this since Abbas would emerge as “the main loser.” “What incentive does he have for it to succeed?” he asked. At best, if Hamas finds its back to the wall, it might agree to freeze the activities of its military wing and place its members on leave, said Elad. “But they will never disband the military wing” as the PA has demanded. Doing so would symbolize “cancelling the resistance” from Hamas’s perspective, which would be unthinkable for the hardline Islamist organization. According to Elad, recriminations over “why this didn’t work out” will likely emerge within days. This is an edited version of an article that was published in JNS.org on August 7, 2018.